I am sorry but Golf Digest has gone too far. Or, is the problem that they have not gone far enough? The magazine’s November 2011 issue includes a feature titled “The 75 Best Golf Resorts in North America…a Ranking of the Top Destinations.” How do the editors come up with these rankings? Bandon Dunes Golf Resort, in Oregon, replaced northern California’s Pebble Beach in the #1 position, a ranking no one with golf expertise would argue about. Bandon is building more courses, each of which is a tribute to varying types of classical golf, and caters to lovers of traditional golf. Pebble Beach slipped to #2. The American Club, in Kohler, Wisconsin, ranks third; Sea Island Resorts, in coastal Georgia, and West Virginia’s The Greenbrier, round out the top-five. Each of those resorts have hosted significant professional tournaments, have celebrated golf histories, and offer multiple golf courses. It is here that the list takes some serious left turns. Golf Digest lists two Hawaii resorts, two Caribbean courses, and two Mexican courses before Pinehurst Resort and its’ eight golf courses designed by famed architects Donald Ross, Tom and George Fazio, and Rees Jones, makes the list at #12. Pinehurst, a National Historic Landmark, founded in 1895, has hosted two U.S. Opens, a Ryder Cup, a PGA Championship, and a U.S. Amateur Championship. A recent restoration of its’ acclaimed #2 course will be vetted by the best when the men’s and women’s U.S. Open is staged on it in 2014. The North Carolina village adjacent to the courses drips charm and golf memorabilia. By contrast, here’s how Golf Digest describes the One & Only Ocean Club/Atlantis, an upscale beach resort on Paradise Island in the Bahamas. Ocean Club, and its’ 18-hole Tom Weiskpf-designed course, rated #8, ahead of the likes of Pinehurst, Kiawah Island, and The Homestead: “The course is cartpaths-only year-round, so the fairways don’t show even the slightest hint of tire tracks. Left-handers don’t fret, Callaway rental clubs are available.” Not exactly stirring the souls of kindred golf spirits, is it? And no golfer likes to play “cartpaths only” anywhere, any time. Sure The Ocean Club shares a pristine beach with the waterslides, shark tanks and casino games of neighboring Atlantis, but one green golf course does not a golf resort make. Don’t think I have some prejudice against island or ocean golf, I applaud the inclusion of the 63 Pete Dye-designed holes at Casa de Campo, in the Dominican Republic. Ranked 66th, though, it is just too far down the list. Is it a coincidence, too, that most of the top “resorts” on the new list are connected to very expensive hotel chains such as Ritz Carlton, Four Seasons, One & Only? In some cases, the Top-75 “resort” on the list was an upscale hotel which didn’t even have a golf course on-property. In that case, why not name The Plaza Hotel in New York a top golf resort since the concierge can certainly set guests up with a round at Liberty National Golf Course across the Hudson River? It’s not that I have anything against high-priced resorts, either. The Grand Del Mar Resort, near San Diego, ranks #70; and The Resort at Pelican Hill, just up the California coast in Newport Beach, feature astonishingly luxurious hotels and gourmet restaurants, but they make an effort to integrate the golf courses into the fabric of the resort. 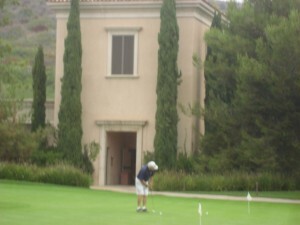 Pelican Hill’s guest villas, bungalows restaurants and glamorous swimming coliseum overlook holes from both of the Tom Fazio courses in the canyons below. The Grand Del Mar goes so far as to light the scenic holes visible from the hotel at night to create a dramatic panorama. True North Golf Club, a struggling new Jim Engh course in a remote area north of Harbor Springs, Michigan, just started building cottages, and yet the property qualifies as the 59th best resort in North America, finishing ahead of the Pete Dye and Donald Ross courses and old world West Baden and French Lick hotels and casino; or Palm Coast, Florida’s Hammock Beach Resort and its’ Jack Nicklaus and Tom Watson-designed courses sprawling below Atlantic-side high-rise hotel suites? And I am sure Michigan resorts such as Grand Traverse Resort and Spa, with Nicklaus and Arnold Palmer designs; and Rick Smith, the owner of the 81 holes of Treetops Resort, wonder how, in contrast to True North, they didn’t even make the list. Some of the other notable, multi-course resorts excluded from the list include Doral Resort and Spa; Marriott Sawgrass Resort; Innisbrook Resort; but I am sure you can come up with some of your own. Does Golf Digest release the list of its “course raters?” Anecdotally, I have met some of the raters, and found a number of them to be of dubious “expertise.” Golf Magazine, by contrast, publishes the names of its elite 100-member international course rating panel, which includes premier players, golf architects, and tour operators such as Gary Player, Tom Doak, Justin Rose and Herb Kohler. Albeit, some of them have horses in the race, but, wouldn’t you trust the presumably discriminating taste of a man such as Kohler, who created The American Club, Whistling Straits, Blackwolf Run, and also owns The Old Course Hotel in St. Andrews more than, say, those 1,000 at Golf Digest? I can understand why you believe the ratings are a bit skewed. As you may know, I have been a Golf Digest rater since the early 80’s and have also been through a number of ratings and panelist changes over the years. Things are done a bit differently now; we have always given only our individual ratings – never seeing the final product before its debut in the magazine. Perhaps the reason these ratings seem odd is because our parameters were very narrow: resorts we’ve personally visited in the last 3 years. I travel a lot but cannot possibly be at all of the great resorts within that time; by limiting our selections in this way, our hands are tied. I’ve visited many of the nominated resorts but could not honestly rate them as if I’d been there since 2008. Maybe the thing to do is for me to contact the magazine and relay your thoughts and ask that we broaden the time line. Of course, things do change and resorts fall out of favor due to outdated courses or amenities so I can agree that some sort of time limit should apply. Regarding the quality and credibility of the 1000 panelists, well, as you know with every other occupation, some are better than others. But I have never met any of them who don’t take seriously the services they perform. We do have an interactive website where much is discussed, though no collaboration on ratings takes place. We also have periodic summits on what constitutes proper course ratings and are required to attend one at least every 3 years. And yes, people do get thrown off the panel by violating the Code of Conduct or by not performing the tasks needed. Mr. Shiels NAILS it on this article. We too produce a golf resort ranking (which I will NOT link to directly to respect the fact this is not a self-promo), and we explicitly addressed this issue in our selection criteria … to even qualify as a “golf resort”, the location must have 36 holes on premise. Maybe that’s extreme, but a 5 star resort that is somewhere near a golf course is NOT a golf resort.